It was just another quiet morning at the coffee shop, or so Rich thought. Then the dark, mysterious Diego walks in and changes everything for the better. That is, until Rich accidentally witnesses a murder on The Strip, triggering a series of coincidences that turn out to be much more than coincidental. They could possibly become extremely deadly… for both Rich and Diego. Can the handsome hunk from Search and Rescue keep his barista safe? Rich is a sweet bundle of nerves. Living in a pigsty with two roommates, his innate need to be clean and orderly is severely challenged. His nearly neurotic need to be tidy is cute and quirky and made me grin sometimes. He’s very likable and the kind of guy I think I’d hang around with in real life. It did take me a minute to place him, however. It’s mentioned that he had a crush on Beau from Held Hostage and it had been downplayed pretty well in that book, so I had a hard time making the connection at first. But once I did, I remembered I liked him even three books back. Diego is the complete opposite of Rich. Dark, swarthy, and rough looking, he works for Metro’s Search and Rescue department, saving climbers and boaters that get themselves into trouble. Looks are deceiving however, because despite his tough exterior, Diego is probably one of the sweetest and most considerate men in this series. He’s absolutely dedicated to Rich, both in keeping him happy as well as safe, which comes in handy near the middle of the book. They make a cute if unlikely couple. 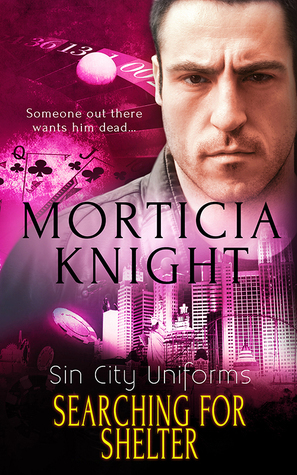 Morticia Knight’s Sin City Uniforms series has become a favorite of mine, and Searching for Shelter was easily one of the best in the series. My one issue with this installment was that Rich and Diego went from acquaintances to forever-in-love a little too quickly. Although, they did spend a lot of time talking and hanging out, not just in the bedroom, so that helped a lot as far as the believability went. Despite the quickness of their love, they are an adorable couple and one that makes sense in the real world as well as in their fictional one. I can’t wait to see what the author has in store for this group of guys next.